The starting age for the kids’ class is 6 years old. By this time, children have been in a class room setting and have the attention for the hour long class. Any child that is big enough and has proven mature enough to handle the adult content will eventually be moved into the adult class. It is very important for you to understand that this is a school, not a daycare as many schools have become. There is no school pick up, after school program, parties or going to the movies. If that is what you are looking for this is not the place. No part of the dojo or the grounds is a play ground and there is to be no running, playing tag, jumping or climbing on the rocks in the garden or around the pond. The grounds should be respected as this is my home. I spend a lot of time working in my garden trying to build an environment my students can be proud of. I also want all students to associate this dojo with serious training and not some place to come and have fun. The training here is about learning life and survival skills through budo. Even though my students enjoy coming to class they know its going to be a lot of hard work, sweat, and at times tears. One will never hear me tell a child that this is going to be a lot of fun. They will hear me tell them this may be one of the hardest things you will ever do. In our dojo children are taught to understand that there is nothing fun about fighting or hurting another living thing. I feel it is import that children never associate fighting with fun. Respect for themselves and others is always a part of each class. Nevertheless, when there is no other choice but to fight back they must actually know how; regardless if it is another child or adult. Teaching children to be more aware of their surroundings will give them a greater chance of survival in situations involving a much larger opponent. They will also learn accountability and understanding the consequences of their own actions. As harsh as it may appear to some I will always tell the truth both to the parents and the students. I do not sugar coat any of the lessons. Its imperative for them to understand the importance of what they have come to the dojo to learn. There are no belts given to children in our dojo other than the one given with their gi (uniform). It is my personal belief that this is an unhealthy practice that gives a false sense of security. I have met far too many students of other schools who have come to train with me believing because of their belt rank they could defend themselves. I see this in both children and adults. This can be very confusing to the child. Belts are something that can be later earned in the adult class when they understand what the belts are truly for and what they represent. Only when they have proven themselves and are ready for that responsibility will any student be allowed to test for rank in our system. Classes are strict, there is discipline, punishments and there is no goofing off. Classes are only 1 hour long and there is no time for disruptive students. Our classes meet twice a week and I requires children to commit to both classes or they will not be allowed to join the dojo. The study of budo takes a life time so there are no semesters or seasons like in sports. So please know ahead of time that if your child begins training at our dojo and, say football seasons comes around, and he wants to take time off for football, please understand that he will be giving up his spot and there may not be one in class for him when he is ready to return. I have a limited number of students that I want in a given class and there have been times there is list of ones waiting for the opportunity to train. I believe in quality not quantity. I will see your child as my own and strive to always guide all of them in the right direction. By necessity, there is 30min gap between the Monday and Wednesday kids and adult class because of our lack of parking. Students are required to gather there thing and be ready to go as soon as class is over. Parents need to be on time to pick up their children so there can be a smooth transition between the two classes. If parents want to socialize, please go up to the church or somewhere else. I do not mean this to sound harsh in any way. This is only because of the lack of parking. When you arrive, you may text me and I will send them right up. The thought of self-defense training for children often brings up uneasy and disturbing visuals for parents. While we want our children to be safe, we are also concerned with taking their innocence away from them. We are forced to admit that more and more children are being faced with dangerous situations every day. A few words parents never want to think of when it comes to their children are "missing", "abuse", or "abduction". However frightening these words are, they are all too often seen in news headlines. The goal is to teach life coping, survival skills and a understanding of how martial arts training will benefit them in all of these areas. By doing so, children set up safety rules for themselves and learn how to become more aware of what is going on around them, all the while still being children. 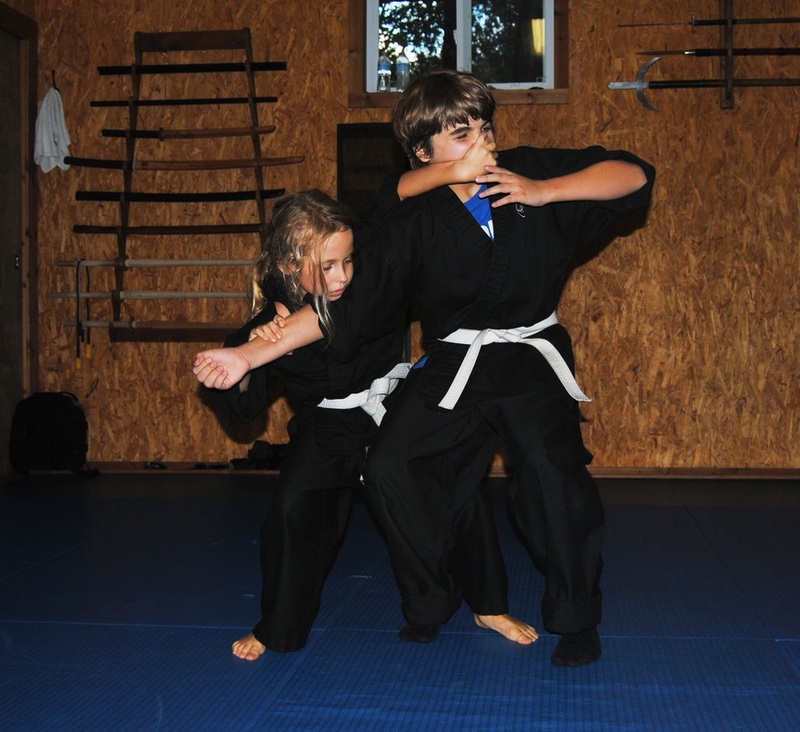 In our dojo children are taught that there are two types of self defense: mental and physical. Children will learn that mental self defense is the most important. They will also understand that the best defense is not always to fight back in the physical sense but to become more aware and street smart. It is our job to teach them how they can fight back with their minds through the use of knowledge. Just as important as what is being taught in the dojo is the attitude toward self-defense that they learn consciously or unconsciously at home. We cannot teach them one thing and do another right in front of them as children can be easily confused by our actions. If they see that mom and dad are aware, pay attention to their surroundings, are not frightened by every little bump in the night, and are confident and self reliant, then children can pick up these traits and absorb them as their own. If we start training our children in this manner they may never have to use physical self-defense. 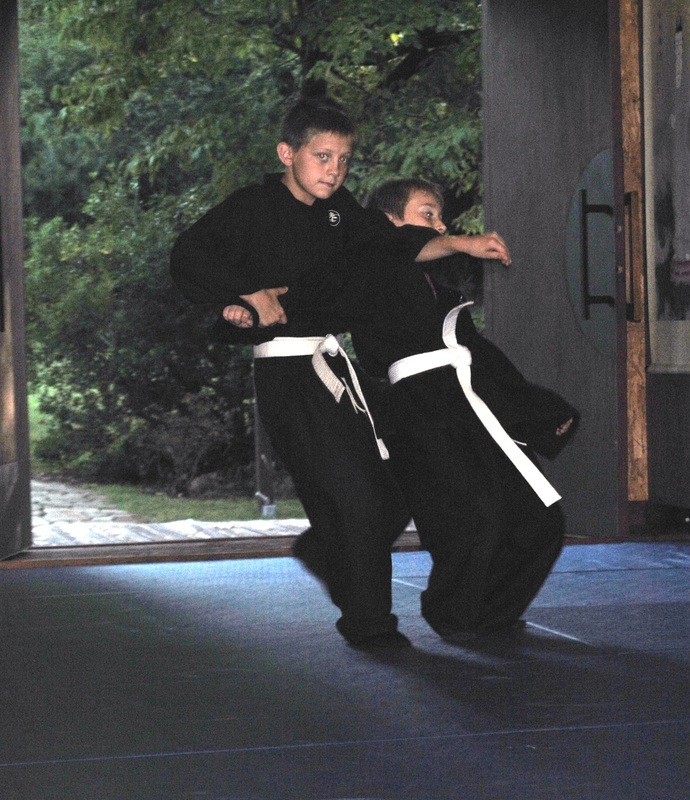 However, if physical defense is necessary then the physical techniques will be simple but effective so that the children will actually be able to practice and perfect them on a fully padded instructor. And, most important, the children are taught how, when, where, and why we would strike another person. These strikes, along with breakaway techniques and how to go for help will also be practiced. Much of this training will be focused on what to do if they are faced with a much larger opponent, such as an adult. We believe that dealing with bullies should also be addressed during the mental training. Therefore, we focus on role-playing since children tend to retain more from actually playing out realistic scenarios. However, role-playing doesn't have to be scary; they just need to be given something they can practice, understand, and remember. We all want to protect our children and keep them safe. However, we cannot always be there to protect them so we need to prepare them and give them the knowledge and the tools to take care of themselves when we cannot do it for them. This is the goal of our dojo. I do not have any children of my own and often tell my students that they are my kids and truly feel that way. I also tell them when they think I’m being the hardest on them through pushing them to their limits or discipline is when I actually love them the most. I take great responsibility in everything I do and say in front of all of my students and want nothing but the best for all of them. I have seen several grow up, go off to college, and start families of their own. Teaching children is a gift and a great responsibility; I do not take it lightly.